It doesn't matter how old you are, what country you're from, or what's going on in your life. We are a range of ages, stages and ethnicities. St D's is open to new ideas as we seek to serve Jesus together. We are a group of folks from all kinds of backgrounds, educations and ethnicities, of all kind of ages and stages. We have somehow been drawn together by God to become a people who live out God’s radical loving mercy and compassion. We have always maintained that the only way to really know what other people are like is to be amongst them and see how they live. We hope that if you spent some time with us, you would see the following major threads in our lives. Devotion to Jesus: Jesus is the centre of our faith. He has set us free to love ourselves, and others. He continues to transform us and enable us to see the world as God sees it – full of loving possibilities. As we spend regular time with Jesus in prayer and service, He sustains us and enables us to keep doing the loving work we’re called to. By allowing us to hear afresh – everyday – God’s life-giving words of encouragement and peace, we can continue in our walk with Him. Loving the family of God. God has drawn us together as a family.We’re getting better at loving eachother as the family of God.And when we do this, the world recognizes that we are truly followers of Jesus. Loving our neighbour as ourselves. Someone rightly said Christians are meant to be the only Club that exists for others. There is deep truth in this. We are deepening our understanding of how much God loves us AND we are growing in our response to the needs of our neighbours – in our street, suburb, country and overseas. Stewards of Creation. We continue to get better at caring for God’s creation as we become more and more aware of how to live simply and sustainably, so that others can simply live and our planet can thrive. We put a lot of emphasis on community at St David’s. We have no paid employees, we are currently all volunteers at St David’s. We are growing as a diverse family, with people exploring how they can be involved in working out their passions and dreams. David was a native of Wales and lived from 500– 589. He was later revered as a saint, becoming patron saint of Wales (in Welsh: Dewi Sant). 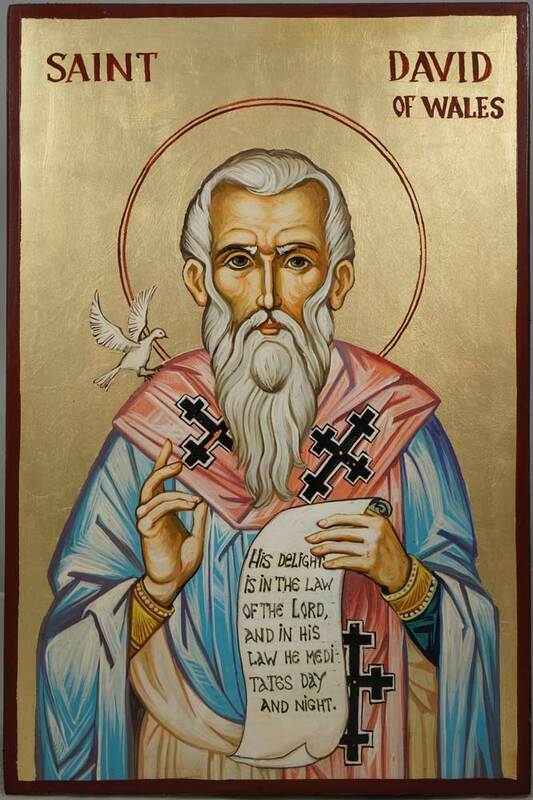 According to tradition, St David was the son of King Sant of South Wales. After a dramatic conversion, he was ordained a priest and later studied under St. Paulinus. He became involved in missionary work and founded a number of monasteries throughout Wales, Southern England and Brittany. The monastery he founded at Menevia in Southwestern Wales was noted for extreme asceticism. David and his monks drank neither wine nor beer - only water - while putting in a full day of heavy manual labour and intense study. The Monastic Rule of David prescribed that monks had to pull the plough themselves without draught animals, must drink only water and eat only bread with salt and herbs, and spend the evenings in prayer, reading and writing. No personal possessions were allowed: even to say "my book" was considered an offence! On his deathbed, St David said to his tearful monks: 'Brothers, be constant. You have freely chosen this way of life and this way of serving Jesus - follow this to the end; and whatever you have seen with me and heard, keep and fulfil'. After his death, his monastery at Glyn Rhosin became an important Christian shrine, and the most important centre in Wales. David was officially made a Saint in 1120 by Pope Callistus II. His feast day is March 1. Church historians are clear that St David had substantial qualities of spiritual leadership. What is more, many monasteries flourished as a result of his leadership and good example. In the face of western materialism and consumption, David’s staunch commitment to monastic piety is a fine example for modern Christians seeking simplicity, order and form in their prayer life and everyday life. What can we learn from him today? At St David’s we take this Patron saint as an example of giving all for the Gospel, and of recognising that the call of Christ was not some simplistic quest for converts, but a wholistic call to discipleship and to making disciples. He recognised that discipleship was not some haphazard thing, but needed significant intentionality. God did the supernatural, while humans are called to do all they can.